Seoul, Korea. 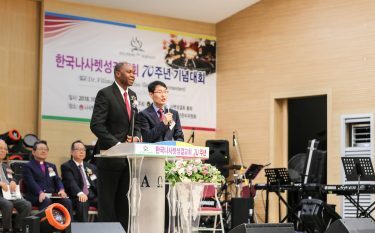 This month was not just the 110th anniversary for the Church of the Nazarene, but also marked 70 years of the Church of the Nazarene in Korea. On October 9, 2018, Global and Regional leaders gathered in Korea to celebrate this event including General Superintendent Filimão Chambo, Regional Director Mark Louw, APNTS President Bruce Oldham, along with several District Superintendents and Field Strategy Coordinators from the Region. 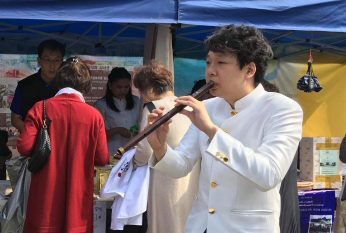 The anniversary was held at Korean Nazarene University which provided a bazaar for the missionaries, concerts and even an orchestra. GS Chambo spoke the main message from Genesis 17:1 encouraging the attendees to continue to live in perfect holiness. He emphasized that like Abraham, Nazarenes should not only seek holiness through a relationship with God but also to be a blessing for all nations as well. The service was closed with a benediction from Rev. Kim Young Baek. Here’s to another 70 years and more!